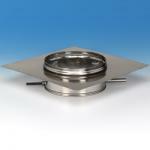 The ICP Vacu-Stack Cap is a great, economical, lifetime warrantied alternative for preventing downdrafts.If your chimney frequently experiences wind-related back-puffing, this cap could solve the problem. 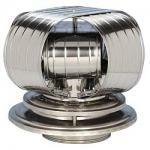 When the wind hits this cap it actually increase upward draft.ROUND FLUES:To attach the Vacu-Stack to relining pipe, just slide the base inside the pipe as far as possible and secure with screws.For SOLID-PACK, class-A chimney with sealed ends, push the cap into the sealed end chimney until secure. Silicon the joint where the chimney and cap meet.For air inslulated or (pipe within a pipe) type chimney use the AIR INSULATED CAPS. Note: To determine the size for all round flues simply measure the inside diameter of your chimney SQUARE FLUES:To use the Vacu-Stack chimney cap on a square masonry flue tile, you simply need the 304-alloy stainless steel Masonry Adaptor. Select the vacustack size that is slightly smaller than the inner dimensions of your flue and select the adaptor that matches the size of your vacu stack chimney cap. 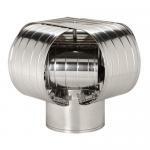 The adaptor is fastened down to the flue and then the vacustack simply slides into the adaptor. RECTANGLE FLUES:We carry 2 sizes and both include the adaptor that you will needA pressure-fit device inside the adaptor secures it to the flue tile. Then you simply attach the Vacu-Stack cap to the adaptor.The Vacu-Stack is made of heavy, 24-ga., 304-alloy stainless steel, and is avaliable in 3" - 16" diameters. These chimney caps will cure chimney backdraft and wind-related backpuffing problems. We carry the ICP Vacu Stack chimney caps for both metal and masonry chimneys. We offer fast, free shipping and guarantee our price. Any questions call 1-888-320-4786.